Today’s teachers and administrators are well-rounded professionals, as their layers of certifications attest. 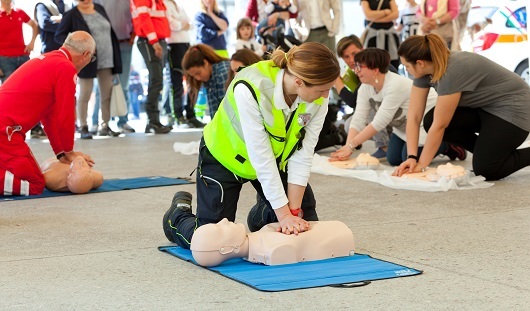 In addition to the standard teaching credentials required for your target student population and/or subject matter, there are all the supplementary certifications you’re expected to hold – one of the most important of which is CPR. We hope you never have to use your CPR training on the job, but the reality is medical incidents are rarely predictable. CPR certification can save lives, and that’s especially poignant if your training is used to save the life of a child. Stories like Justin Ochoa”s, a North Carolina 8th-grader who suffered a cardiac arrest and was saved by teacher-administered CPR, or the tale of Virginia teen, Paul Dow, who saved a collapsed teammate via recent CPR training, prove your staff’s CPR certifications matter. Here are some of our favorite resources for curating reliable, CPR content you can trust – including content you can post in classrooms, hallways and common areas. The more educated students and staff are when it comes to CPR and other basic first-aid principals, the better off your school will be in the case of a medical emergency. Of course, nobody knows and loves the heart better than the American Heart Association. Their CPR page has a list of resources for those who need to get certified or renew their certification, and there are plenty of certified instructors who will come right to your campus, making certification and re-certification easier on your employees. The American Heart Association also offers training for students. Check out their CPR in Schools page to learn more about simple courses you can offer to the school-at-large or to key members of your student body – like ASB leaders, athletes, athletic managers or designated student safety officers. The more people on campus who are trained to perform CPR, the better the outcome will be if anyone ever needs it. We also recommend visiting their Hands Only CPR page. It’s a very simple and “feel-good” way to teach children and caregivers that even the most “rudimentary” CPR can make a valuable difference in sustaining human life until EMTs or other qualified medical personnel can take over. The Red Cross brand is recognized and trusted worldwide. Administrators and teachers can use the Red Cross’s Take a Class tool to locate a local CPR certification course – or to contact freelance certified CPR instructors in your area. We should also point out that teachers and admins make spectacular CPR instructors. 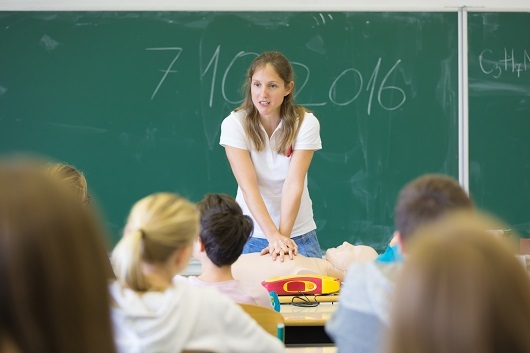 Teaching is already your calling, and becoming a certified CPR instructor is a wonderful way to make extra money during holidays and/or summer break. The Red Cross offers a wide range of certification courses and many of them are available online, making them easy to fit into your own holiday or weekend schedule. With online access for up to two-years, you can finish your certification in as little or as much time as you like. Here’s another great resource offered by the American Heart Association program. CPR in Schools operates on the premise that teens should know CPR. Not only will it come in handy in a school emergency, it’s a helpful thing to have in the memory bank for students who take care of younger siblings or in case a parent suffers a cardiac arrest or medical emergency requiring CPR. Are you aware that some states have made CPR and/or First-Aid certification mandatory for graduation? Talk about practical education that you can take with you for a lifetime – we’re all for it! The CPR in Schools programs will help you establish and facilitate CPR courses, hosted in the campus gym or multi-purpose room and all targeted to specific age groups. They also offer full CPR training kits and referrals for AED supplies you can install in high-traffic hallway junctures and accessible common areas. You may be surprised at how empowering it is for children, ‘tweens and teens to know they have the knowledge and skill set to save a life – not to mention a credential to add to their own resumes. You know one of the best ways to avoid having to administer CPR? Foster a healthy student body. A healthy diet and ample movement significantly reduce the chances of obesity, heart disease and cardiac arrest. Visit the U.S. Department of Education’s Healthy Student website and explore ways your school can make nutritious food and movement a regular part of staff and student life. If you’re looking for a local solution to certify teachers, administrators staff or students in Virginia or North Carolina, contact the CPR Consultants. From certifying your own CRP trainers to planning large-scale training sessions for all ages and interests, we design courses that are simple, engaging and effective. Contact Us to Learn More About CPR Training!